Relational Coaching is a radically different way of looking at coaching that puts the relationship, from the perspective of the coachee, at the centre. 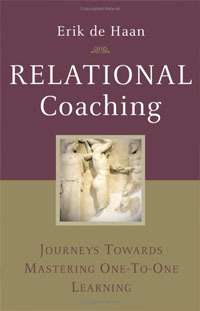 Relational coaching is part of an age-old tradition but has also been reinforced by a number of reliable studies in recent decades. Don’t worry too much about your specific behaviour in the moment. This book demonstrates how each of these commandments is underpinned by sound quantitative research. Relational Coaching gives a complete overview not only of the profession and the latest developments in coaching but also of the state of the art in other respects. The second part of the book presents new quantitative and qualitative research into effects and experiences of coaching. Part III contains an introduction to the activities that make a good coach and the mechanisms used to verify coaches’ understanding of their profession. Other topics covered include training, accreditation, supervision and recommended literature.